Their are so many new options of quilting thread now, how do you choose the best one? Since quilting has become such a popular art for amateurs and professionals alike, the industry has blossomed. There are more threads being produced than ever and the variety is huge. Therefore, you might be confused when having to choose thread for quilting and find there are too many available options. There are a staggering amount of threads offered in a quilt shops and on the Internet. Quilting thread is classified under two categories; they are sewing and embellishing thread. Sewing thread is the one most used and is especially fit for quilting. This thread is used to sew the seams together and most likely will not be seen in the finished product. Even though it will not be seen you should still choose a coordinating color or a light color to blend in with your work. 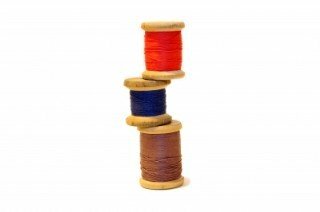 Sewing thread comes in a variety of options, fibers and weights alike and the latter can be between 28 to 60. Because sewing threads need to be durable and withstand the test of time, you should buy threads of 40 weight or somewhere near this number. Those closer to 28 threads are for embellishments and those with a weight of 50 are sturdier and stronger, therefore used for piecing. How do you read the weight of a thread? Just study the label and you will see a little marking on the label, saying for instance 40/2. This means the thread weight and respectively how many plies it has. Therefore, the thread in the example has a 40 weight and 2 plies. Threads designed for quilting are made of cotton, polyester, plastic, rayon or metallic materials. The metallic or plastic threads are commonly used in embellishments or to add specialized stitches. The cotton ones are used at larger scales and therefore they are widely available. They are also subjected to a mercerized process, in which the cotton threads that are treated with sodium hydroxide to shrink and increase their luster and affinity for dye. Cotton threads usually weigh from 30 to 60. Rayon threads also display an increased affinity for luster while the polyester one holds the advantage that it doesn't shrink when washed and it neither loses its color. You should also bear in mind that metallic threads are more difficult to use, so this type of sewing is not for beginners. When purchasing threads for your quilting, look for the specialized companies that have a long term tradition and quality reputation like Coats and Clark, or Guterman specializing in hand quilting and renowned for the quality and refinement of their threads, Madeira rayon threads, strong enough to be used for embroidering on denim and leather or Mettler, a company which offers several types of fibers. For manual quilting, you can utilize embroidery floss, which comes in different shapes and fibers and is widely available. Another thing to consider is your sewing needle; if it's old and rusty, you should get a new one. Also be sure the tip is sharp and the eye of the needle is not so small you have a hard time threading it. If you come across threads that are weak and snap, it's best to not use them because they will snap inside your sewing machine too. Do not use thread that is very old either, it is best to buy new quilting thread whenever you need and don't try to save money on the threads' quality. After all, you will end up less frustrated and you don't want your quilt to fall apart after a few washings. At the end of the day, by wisely choosing quilting threads you will add beauty and a professional touch to your quilts.